Welcome to the opening screening of the inaugural Bioscope Festival of Lost Films! Over the next five days we will be bringing you five feature films (with accompanying shorts), each of them notable film productions, and each (so far as can be ascertained) a lost film, untraceable in any of the world’s film archives or private collections. A Study in Scarlet is the second feature-length film with the character of Sherlock Holmes. 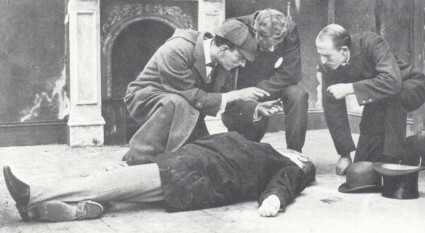 It is not the first film to have been made of Conan Doyle’s detective – that was the American Biograph film of 1903, Sherlock Holmes Baffled (a film which survives) – and it was preceded by several Holmesian films including earlier in 1914 the French four-reeler, Le Chien de Baskerville (also lost), which seems to have been the first Holmes feature film. This six-reel British production is based on the first Sherlock Holmes story that Conan Doyle wrote, and it has been authorised by the author (unlike an American two-reeler based on the same book made later in the year). This exciting story of murder, love, revenge and detection takes place among the Mormon pioneers of Utah in 1850. Years later, in London, the great detective Sherlock Holmes is called upon to solve a murder, the roots of which lie in a man’s sworn revenge against the Mormons. TB: Mr Pearson, can you tell us how you managed to recreate the Salt Lake plains and the Rockies in England? GP: The film called for ambitious locations, but much can be suggested camera-angles to hide geographical inaccuracies. We discovered what we needed in the Cheddar Gorge and the Southport sands. TB: How did you find your Sherlock Holmes, Mr James Braginton? GP: Sherlock Holmes was a problem; much depended upon his physical appearance, build, height, and mannerisms had to be correct. By a remarkable stroke of fortune Samuelson had an employee in his Birmingham office who absolutely fitted these requirements. TB: But surely he could not act? GP: A tactful producer can control every action of an inexperienced actor. I decided to risk his engagement as the shrewd detective. With his long and lean figure, his deer-stalker hat, cape-coat and curved pipe, he looked the part, and played the part excellently. TB: The scenes of the wagon train are very impressive. What planning was involved? GP: As Buckstone and I were finishing our last scenes in the gorge on June 25th, we received an urgent message that all was ready at Southport; everything possible had been done to meet the problem of a suitable date for all concerned, and that date was Friday, June 26th, and furthermore, only the morning of the day! There was a little moonlight when we arrived, and since Buckstone and I had not yet seen the actual sport in the sands where it might be possible to stage that long procession of waggons, we spent the anxious hours before dawn in search of a suitably lengthy gully, and with a compass to guide us stuck sticks in the sand to mark the camera position and the line route for the waggons. The long snakelike winding caravan had to appear round a far distant bend in the sand-dunes, and move slowly towards the camera position. We had to get that important scene right first time, for a retake could only result in utter chaos. 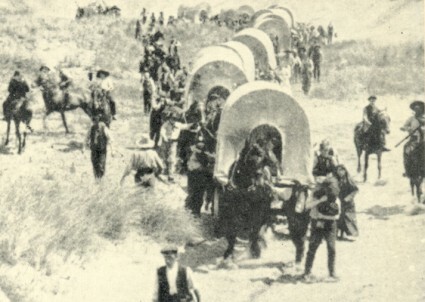 How we got that long line of wagons with their characteristic hoods, the cattle, the women, children and bearded drivers past the camera without mishap is beyond belief, but get it we did. The producer of this great work is the ebullient G.B. ‘Bertie’ Samuelson, who created such a sensation in 1913 with his bold epic of the life of Queen Victoria, Sixty Years a Queen (of which just a one minute fragment survives). Bertie was born in Southport, Lancashire, so this is very much a personal film for him, with many local people turning out to play the Mormon pioneers. It is also the first film to be made at Mr Samuelson’s impressive new studios at Worton Hall, Isleworth, on the outskirts of London. The spectacular production has been acclaimed already by the critics, who have been impressed by its economy of style, its scenic settings, and the intense performance of Mr Fred Paul as the vengeful Jefferson Hope. Some have even gone so far to say that the work improves upon aspects of Conan Doyle’s original novel, by cutting out some of the more wearisome descriptive manner. Enthusiasts of the great Sherlock Holmes may feel that his appearance, only towards the end of the film, is a little too brief, but all are agreed that these scenes are undeniably dramatic. Owing to the unfortunate outbreak of the Great War, the film’s release was delayed until December 1914, though we understand that Mr Samuelson managed to sell the film to the United States for a handsome four-figure sum. If anyone is going to put the British film on the map (at last!) it will be the indefatigable Samuelson. The main feature will be preced by a short film, equally lost. The Great European War (UK 1914) is a Samuelson production which he has made in the period between the outbreak of the Great War and the release of A Study in Scarlet at the end of 1914. This startling compilation of actuality film and dramatic inserts is a typically bold, if hurried, flourish from Mr Samuelson. As George Pearson, the director, tell us, Mr Samuelson conceived of the idea of a film about the war on the evening of the day on which hostilities were announced, 4 August 1914. They wrote the script all night and began production on 7 August! Mr Pearson calls the film ‘a fictitious News-Reel brought bang up to date with material provided by the headlines of the daily Press’. Every out-of-work actor in town has been comandeered, along with every concievable kind of military costume. Filled with trenchant symbolism (‘a flag unfolding, a lion rampant, German hands tearing a parchment treaty to pieces…’) this is filmmaking forged in the heat of the historic moment. Posterity may find it all a little on the ridiculous side, but posterity was not there at the time, and in any case posterity does not – we fear – have the chance to see it. As this wonderful film dates from, 1914 I rummaged through last year’s couture to array myself in Poiret. Sorry about tripping over the hobble-skirt and rolling down the aisle, but thank god, no corset required. I’d like to compliment Ms. De Jong on her nuanced and yet thrilling score for this film–I’m humming it still. Luke: It was a moving show, enhanced by the fact that I’m in the process of reading “The New Annotated Sherlock Holmes.” And the short subject was an excellent choice to round out the program. Can I reserve a ticket for the next program? Tickets are still available for this evening’s performance (though please note that children are not permitted to either this evening or tomorrow evening’s shows – nor Friday’s, for that matter). In writing the pieces I am having some trouble with tenses and times. I wrote as though in 1914 for A STUDY IN SCARLET, but will be moving to 1925 for this evening’s show. It’s all very odd. Glad to see everyone is entering into the spirit of things. I wasn’t aware Pearson’s version of A Study In Scarlet had been found. Anyone have information on how this came about? It hasn’t been found. This was a festival of lost films, and A STUDY IN SCARLET sadly remains very much a lost film. Apologies if the style of the piece has misled anyone into thinking that the film exists. Who do we get in contact with to find out more about A STUDY IN SCARLET? Has the film been digitally transferred? We’d be very interested in screening this film in Salt Lake City, Utah, USA as that is where the story begins and mostly take place. Please let me know who to get in contact with to talk more about this. P.S. We have several wonderful theatre pipe organs in the area and could do a recording for the film. It would be great to play the film at The Organ Loft with live Wurlitzer Pipe organ scoring. Please note the content and tone of the post, and of the comments that followed it. A Study in Scarlet is a LOST FILM. I wrote about it as though it existed because I was using the blog to put on a “festival” of lost films. It was supposed to be a witty conceit. It would be wonderful to see the film in Salt Lake City, or indeed anywhere, but sadly that canot be – no print is known to exist. Please forgive me if I’m being very annoying, only with George Pearson having died in 1973 I’m wondering how The Bioscopic(TB)has managed to inverview him. If this is the house style then my apologies again. Absolutely terrific resource, by the way. The point of the Bioscope Festival of Lost Films, of which this virtual ‘screening’ was a part, was to showcase films that can no longer be seen as if we were seeing them. However, the whimsical style has confused some people. The ‘interview’ with George Pearson is in fact words taken verbatim from his 1957 autobiography Flashback. Apologies for any confusion – and thank you for the kind words about the site. You’re not being rude, but I’m not the person who lost it. Around 80% of all silent films are considered lost. Many film companies neglected to care for their silent film holdings when sound films arrived, because they no longer had any commercial value. Other film companies had gone out of business by then and their libraries were not preserved. The films themselves were on fragile, inflammable stock and deteriorated if they weren’t cared for. Some silent film stock was simply melted down for its silver content. There were vitually no film archives before the 1930s to care for historic films, by which time many films were gone for ever. It’s amazing that any films from the silent period survive at all. Often they survive because of the dedication of collectors who valued the films when no one else did.